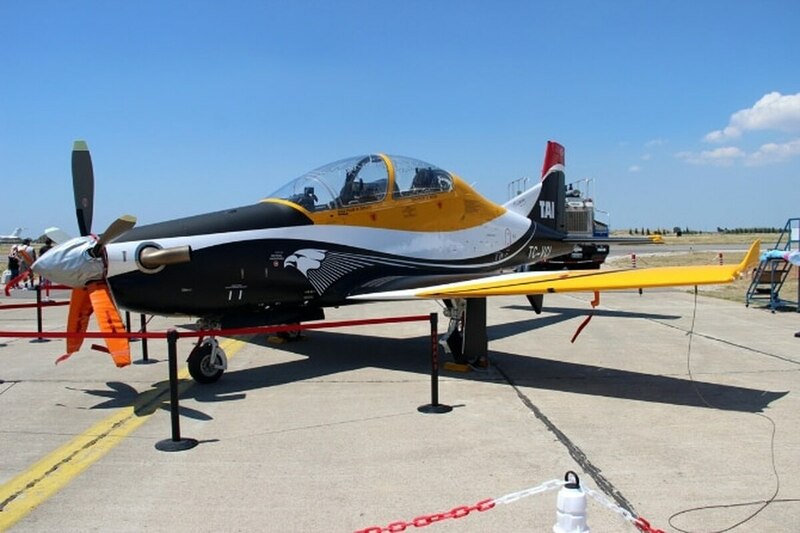 ANKARA, Turkey — Turkey's Defence Ministry and aerospace powerhouse have jointly unveiled a prototype of the country's first indigenous armed trainer aircraft, with a view to compete in international markets. The Hurkus-C close-air support and lightweight attack aircraft is an armed version of the Hurkus turboprop-powered basic trainer Hurkus. Tusas Turkish Aerospace Industries, or TAI, won European Aviation Safety Agency certification for the Hurkus-A, the civilian variant, in July. "The basic idea behind the Hurkus-C program is to export this model to international markets," a senior TAI official said. "It is a matter of time. … As the aircraft and its weapons systems mature and become combat-proven [after their use in the Turkish military,] the Hurkus-C will have strong export prospects." TAI hopes to deliver the Hurkus-C to the Turkish Armed Forces in 2018. The Hurkus platform features a single Pratt & Whitney Canada PT6A-68 turboprop engine that comes with a power rating of 1,600 shaft horsepower and a maximum speed of 574 kph. TAI's sister company, Tusas Engine Industries, which specializes in engines, is locally developing a turboshaft engine to replace the Pratt & Whitney Canada engine. The Hurkus-C has a payload of 1,500 kilograms, which can be utilized through seven external hard points. The prototype showcased at a ceremony featured the UMTAS, an anti-tank guided missile developed by the state-controlled missile-maker Roketsan. Other systems on the Hurkus-C included Roketsan's Cirit laser-guided rockets, an electro-optical and infrared pod developed by military electronics specialist Aselsan and an external fuel tank. Aviation industry sources say TAI's main competitors from a longer-term perspective could include the Embraer A-29 Super Tucano and IOMAX Archangel. All three models are positioned to provide close-air support in low-intensity combat environments. "It is uncertain how soon the Hurkus-C can be a combat-proven option," a London-based aviation specialist said. "It is also uncertain how cost competitive the final product would appear on the market." Local defense analysts are more optimistic. They say the Hurkus-C would be widely used in Turkey's increasing counterinsurgency fight against pro-Kurdish and Islamic militants both inside Turkey and across its Syrian and Iraqi borders. "The aircraft will provide the military with a viable option to fight asymmetrical threats as it will substantially cut back air power costs [compared to the conventional use of F-16 fighter jets]," said Ozgur Eksi, a senior analyst at C4 Defence. "It may follow the same successful path of locally developed armored vehicles." Many of Turkey's tactical armored vehicle models developed and built by local manufacturers have found lucrative export markets after their extensive use by the Turkish military in counterinsurgency combat theaters. TAI officials say potential markets for the Hurkus-C could include Gulf, North African and Asian countries. Last year, Turkey started talks with Pakistan for the sale of the Hurkus basic trainer aircraft. TAI's engineers began to design the Hurkus in 2004. For the Hurkus program, TAI signed two contracts with Turkey's procurement agency, the Undersecretariat for Defence Industries, or SSM in its Turkish acronym: one for prototype development and the other for serial production. Under a June 2014 serial production contract, TAI will deliver 15 aircraft with a follow-on option for 40 more. SSM officials say they expect the Hurkus-C to perform successfully in foreign markets in the long term. "Foreign contracts will follow local deals after serial production and local use," according to an official familiar with the program. "There will be strong government support for any future Hurkus-C export deal." The London-based aviation specialist said he anticipates the Ankara government will start marketing the Hurkus-C with politically friendly countries in the Middle East and Asia.